VE Commercial Vehicles' total sales number comprise of both, the 5,808 units sold by Eicher brand and the 98 units sold by Volvo brand. 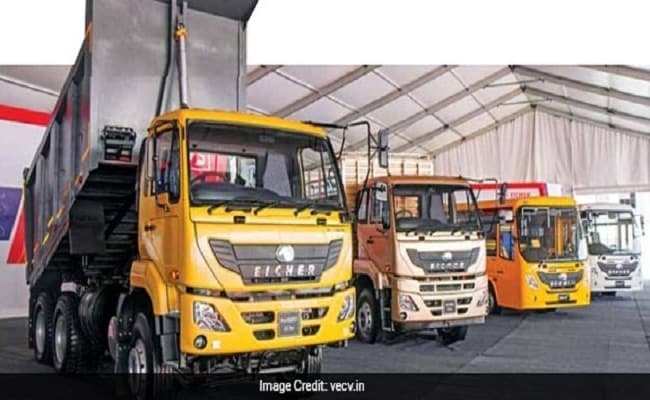 VE Commercial Vehicles, a Volvo Group and Eicher Motors joint venture, has releases the sales results for the month of January 2019. The company has recorded sales of 5,906 units in January 2019 as compared to 6801 units in January 2018, registering a decline of 13.2 per cent. The company's total sales number comprise of both, the 5,808 units sold by Eicher brand and the 98 units sold by Volvo brand. Last year, in January 2018, Eicher branded trucks & buses accounted for 6712 units, which means, last month, with 5,808 units, the company saw a decline in sales of 13.5 per cent. In the domestic market alone, the company sold 5,177 units in January 2019 as compared to the 6,010 units in January 2018 recording a drop of 13.9 per cent. On the exports front, Eicher branded trucks & buses have recorded sales of 631 units in January 2019 as compared to 702 units sold during the same month in 2018, registering a decline of 10.1 per cent. In comparison, Volvo Trucks, as already mentioned, recorded total sales of 98 units in January 2019, registering a growth of 10.1 per cent, compared to 89 units sold by the company during the same month last year. As for year-till-date (YTD) sales, Eicher branded trucks & buses have recorded sales of 56,929 units between April 2018 and January 2019, against the 48836 units sold during the same period last fiscal year, achieving a growth of 16.6 per cent. Volvo Trucks, on the other hand, during the same period this fiscal year, sold 935 units, compared to the 796 units sold between April 2017 and January 2018, registering a growth of 17.5 per cent.